Chris Oynes will step down as associate director of the Offshore Minerals Management Program, an official says. Official: "This was Chris Oynes' decision to retire after almost 35 years of public service"
Washington (CNN) -- The head of offshore drilling at an Interior Department agency criticized after the Gulf Coast oil spill is retiring a month earlier than planned, an administration official told CNN on Monday. Chris Oynes will step down as associate director of the agency's Offshore Minerals Management Program at the end of May, the official said. The program is part of the Minerals Management Service. "This was Chris Oynes' decision to retire after almost 35 years of public service," the official said. "Shortly after the Deepwater Horizon explosion, he approached leadership at MMS and announced he would be retiring on June 30, and today [Monday,] he told his colleagues that he would be accelerating his retirement." 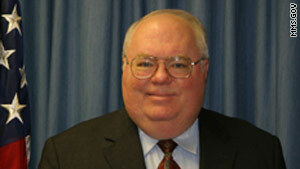 Oynes was named to the post in 2007. His responsibilities include overseeing the Outer Continental Shelf oil and gas program and working on a new alternative energy program. In the past, critics have accused MMS of being too cozy with the industries it regulates. A 2008 report from the Interior Department's inspector-general found MMS employees received improper gifts from energy industry representatives and engaged in illegal drug use and inappropriate sexual relations with them. Interior Secretary Ken Salazar last week announced he would split MMS into separate divisions -- one for regulating offshore oil drilling and the other for collecting royalties from oil companies. Salazar said that having both responsibilities in one agency created a culture of possible corruption. Oynes previously was the regional director of the MMS' Gulf of Mexico Outer Continental Shelf Region in New Orleans, Louisiana, for 12 years. "His involvement with the MMS has covered a wide range of issues," according to the agency's website. "He has been actively involved in how MMS conducts its resource projections and its environmental reviews, and the operational safeguards it imposes. During his tenure in the GOM, he conducted 30 lease sales and oversaw a 50 percent rise in oil production." Oynes has a law degree from George Washington University and a Bachelor of Arts degree in political science from California State University at Fullerton.